For those who love all the new beads coming on the market, here’s a free pattern for the new Cali bead—Czech 3x8mm marquise-shaped beads with three holes! 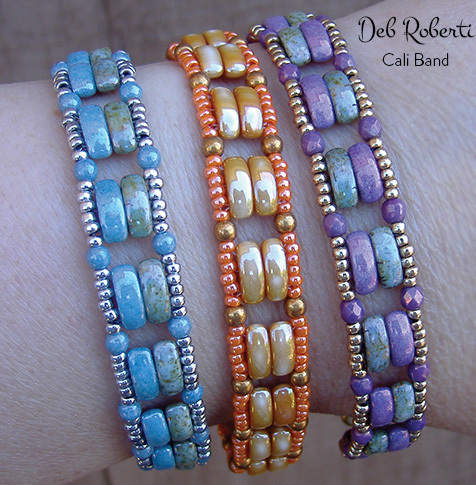 These beads remind me of watch band links and I love the way they look paired up in some easy stacker bands. You can, of course, stack the beads or the bands as high as you want. It’s a very easy, and sturdy, stitch pattern to master. Links to the exact beads used in the photo above at the end of the step instructions. Step 1: Thread your needle with about 3 yards of FireLine (or start with a length that you feel comfortable working with and add more later). 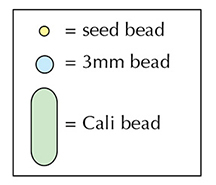 Leaving about a 6-inch tail that you can weave in and make disappear at any time, string a seed bead and go through the bottom holes of two Cali beads. String a seed bead, a 3mm bead, two seed beads and a 3mm bead. Step 11: String a seed bead, a 3mm bead and a seed bead. Go through the bottom holes of two new Cali beads. String a seed bead, a 3mm bead and a seed bead. Step 15: String two seed beads. Go down through the seed bead, the 3mm bead and the seed bead highlighted in RED. Step 18: String two seed beads. Go down through the three seed beads, the 3mm bead and the seed bead highlighted in RED. Step 19: String a seed bead, a 3mm bead and a seed bead. Go through the bottom holes of two more Cali beads. Go down and around through the five seed beads, the 3mm bead and the seed bead highlighted in RED. Step 22: String two seed beads. Go down through the seed bead, the 3mm bead and the seed bead highlighted in RED. Step 24: String two seed beads. Go down through the three seed beads, the 3mm bead and the seed bead highlighted in RED. Step 26: To attach the other end of your clasp, string a seed bead, a 3mm bead, two seed beads, a 3mm bead and a seed bead. Go around and down through the five seed beads, the 3mm bead and the seed bead highlighted in RED. Step 28: String a seed bead. Go through your clasp and then back down through the seed bead that you just strung. Use your extra tail thread to go back through the beads along the outer edges.